HAHAHA. so you have a spare cage lying around? I'll cut the roof off and just drop it in. 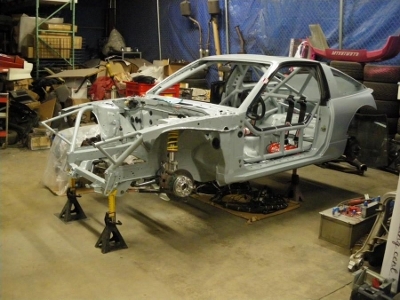 Actually be easier to use the current car as a sports sedan, and do a time attack style cage in the spare shell. 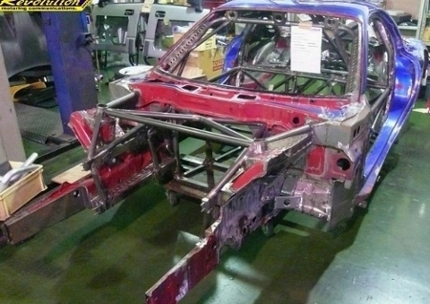 I'd do most the same, but extend the cage to include the suspension towers front and rear. Then cut everything else away and start with a clean sheet. Run the exhaust through the cabin on the passenger side next to the trans tunnel and box it using sheet metal (essentially widen the tunnel) and out the boot. You haven't run your hand through a timing chain or something again have you? Not quite, all limbs intact. A minor spinal injury that sees me with nothing to do but stare at the ceiling and dream up plans for the car (and write offensive posts on your blog, obviously). That's kinda what I've got in mind for mine, although I'm thinking of maybe keeping the chassis rails on the front for two reasons - impact resistance (and by that I mean it makes mine stronger than the fibreglassed, spaceframed car that I hit) and engine mounts & suspension pick up points are already there and set. Like I said though, still contemplating it all. Plans are drawn in pencil on my ceiling if you need to take a look. Since when do spinal injuries get called minor? Hope you are going to be al right. I have often wondered why I don't change my paint. I am tempted to get a bunch of 3K3 Mica red (same as my road car) so I have have a matching pair. No one takes photos of black cars. Painting is another of those lots of labour type jobs I can manage myself. I have been waiting for a 12 cubic foot or better compressor to pop up on gumtree on the cheap. My little one runs out of puff when you paint anything larger than a helmet. MY microsoft painting skills are awesome! I love how you've even added the flowers in the background. Such detail. When the neurosurgeon said, "Urgent MRI" today I assumed the M stood for minor. So I cant remember if I posted this or not: My Ikeya Formula Roll Centre Adjuster Lower Control Arms (IF RCA LCA...?) have made it through customs and are sitting in a steadily growing pile of boxes in the shed. After seeking advice on here and from my tuner, I would seem I am going to buy six shiny new Bosch ID1000 injectors, and a fuel rail kit. Turns out my tuner can do the lot for about the same price as the online shops. I am also buying the Haltech dash from him as well, as he sells at the Haltech online price. Who says bricks and mortar shopping is dead. The good thing is if something goes bad, I have a real person to deal with. Keen followers would realise these items were NOT part of the short-mid term plan described a page back. Unless I trip over a leprechaun on Saint Pats day, the roll of CF might get the chop to pay for the fuel system, tuning and IF RCA LCAs. Fibreglass is cool too right? Tuner is a fan of E85. I have plenty of time, so I will think about it. I reckon we might be a bit short of the $400,000, Andrew. 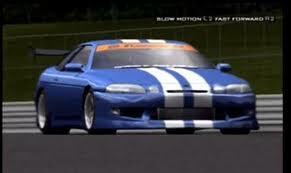 As for the front i would just read the rules of what events you want to enter and see what others are doing if you build the front end right there is no reason it would not be as strong or if not stronger then a stock front end. If I said we were  way short, I'd just be being honest. If I said we probably couldn't sell our cars for half what they cost us, then I would be negative, LOL. I think you misread the add. My car is race ready and yours has all the bits ready to put together. In fact you are right- you need the one that is ready to go. If you had to put it together yourself, you'd break an arm or leg or something. Thanks Robert. I had a look at your cisco kids link but my crappy internet connection tried my patience. What parts are you developing? What have you got that I could use, LOL? Andrew- back to you. Got your email. Gonna respond here. (See comments about crappy internet connection.) I haven't driven the car in anger since fitting the rear end bushes etc, but I have driven up and down the street *cough* (for the coppers reading that bit was a lie). Could not tell much from that. I really must get this thing screwed together and back onto a track before people start to talk. At this rate Paul will have his Mazda running before me. But then it will break down. Umm, thanks Dave, I think. I have been talking to Simon at MORPOWA a bit these last few weeks. I am now pretty sure I am going to run the car on e85. At the very least, the fuel system components will all be set up to survive e85. This meants more expensive hoses etc. The rest of the gear I have purchased in the last few months is suitable, and can support 400rwkw allegedly. E85 has more power potential, but you need around 30% more fuel, meaning bigger pumps, injectors etc. You also need to make sure your hoses and fittings will handle e85, a lot of rubber will not. Like any fuel, you need to tune for it, so it is not just a case of filling up and making power. you in the shed yet ? LOL, yes. I couldn't resist. Found out the wheels do not fit over the front brakes. I need about 7mm more clearance. I have decided to buy 15mm thick aluminium hubcentric spacers with the additional studs press fitted to them. This will both allow plenty of room to clear the calipers, and also widen the track. The rear track with the new rims looks to be half an inch wider per side, so this will get them closer to even. 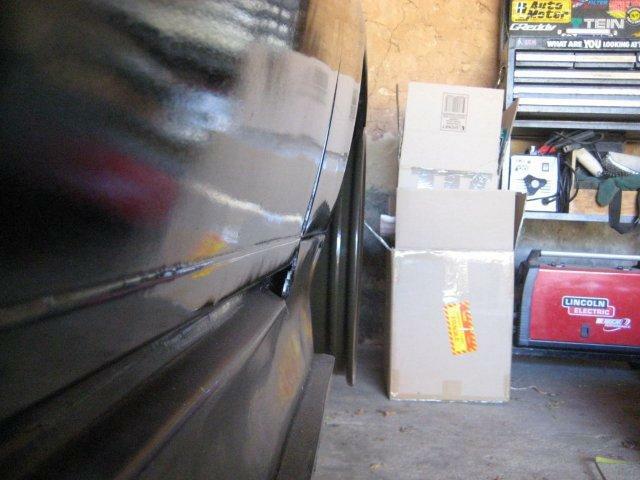 Need to look at the stock spec sheets and see what the original track width is, as all my wheels on all cars are staggered fitment, so I cant measure it. Before Paul shouts it to the world, I might need to look at wider guards. The rims sit just past flush with the top of the guards. 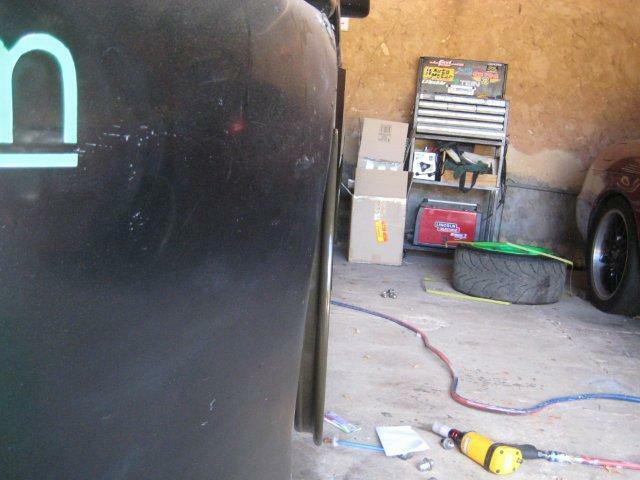 I might be able to get away with having the guards rolled, otherwise it looks like more custom body work for me. Someone on here offered me the use of a guard roller once. I might have to go back through and have a look. The distance between the centers of the wheels on the front axle. 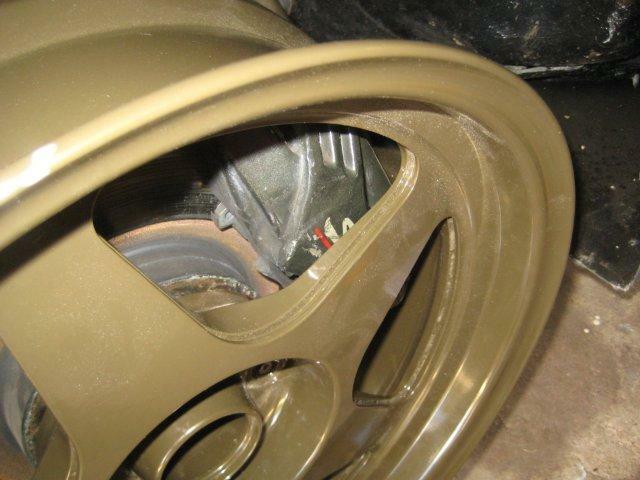 The distance between the centers of the wheels on the rear axle. Rear 17x10 +40 will extend 54mm wider than stock. Front 17x9 +38 will extend 44mm wider than stock, and 59mm wider with the 15mm spacers. 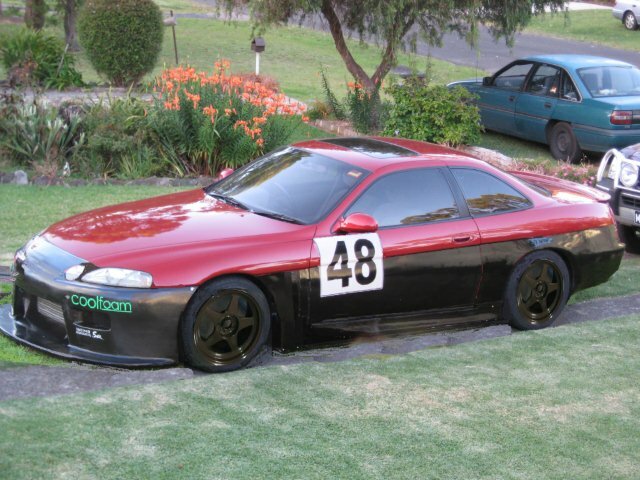 Hmm, in my handbook (the dodgy one you get from importers when you buy your Soarer) it has track width at 1520mm front and rear. I got the other values from on here, but on second reading they are the maximum allowed in SA. My handbook also says the factory wheels were 16x7, meaning everything I wrote above was unfounded rubbish. Oh well, it is the internet after all.